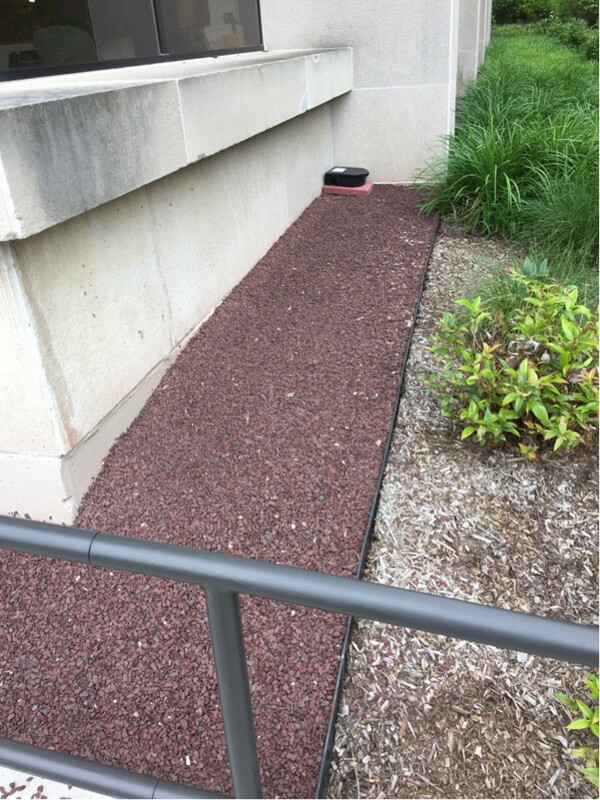 Why do many landscapers put gravel around the base of buildings? 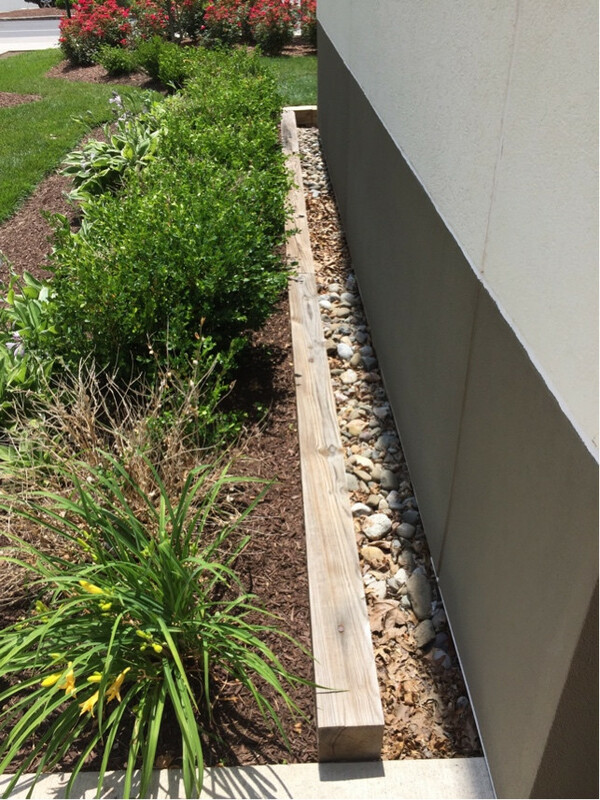 Where I live, I've noticed many buildings have a stone/gravel barrier between the building foundation and the lawn or flower bed. Why is this? Does it prevent insect or pest infiltration of the structure? You don't want water-retaining soil sitting against the building because this causes damp problems. Creating a porous soakaway like this will mean any water sinks to a lower level than would cause any harm to the building. Perhaps I missed something in the other answers. The one and only reason is because of SPLASHING. Rain over the gutter, a hard sideways rain will splash mud/soil onto the siding. Not good for siding as the mud tends to hold moisture too long and can cause rot as well as a dirty 'skirt' on your siding. The gravel, drain rock, cobble or even the lava rock as pictured in the first picture however needs to be below the siding at least 4" otherwise the rock becomes a moisture problem. That first picture with the lava rock and the trap? That lava rock is touching the siding. The siding appears to be concrete. Concrete foundations need to be coated with asphalt for protection. Concrete is very much harmed by moisture. The picture with the 4X6 holding in cobble? If that rock is as close as I think it is to the siding, that will rot the siding if it is not at least 4" below the siding. Before the cobble or gravel gets installed this is when landscape fabric is necessary. Not to prevent weeds but to prevent the cobble sinking down into the soil and the soil replacing the cobble. I wish I could find a more common mulch people could use instead of chunky bark. This is not for weed suppression it is to unify a landscape by covering the soil with a regular texture. Chunky doesn't work. Fine works far better for aesthetics and for decomposition sometime in the near future. The only mulch I will ever use in the landscape is human poo mixed with sawdust and completely decomposed professionally. Grins. That 4"X6" (not pressure treated)? is a great condominium for insects and other animals; slugs, snails, earwigs, pillbugs...and many more. Not at all necessary or even beneficial. I lived and breathed construction in all forms for half a century. The only reason and it works well, for using cobble at the base of an outside wall, is for splash. My guesses are that it just looks a lot neater and also prevents weeds from growing near the foundation. If weeds and their roots are allowed to grow there you would have to be constantly digging them out, and roots are already hard enough to get out of the ground without having to dig near or under that area. Another reason, I think, would be because it is a more permanent solution to weed prevention instead of mulching. Mulching has to be (or should be) removed and/or replenished yearly to maintain an attractive appearance. Lots more work to do that way. Some jurisdictions require non combustible mulch i.e. gravel next to the structures. Several buildings have had fires started from discarded smoking materials in combustible mulch. Not the answer you're looking for? Browse other questions tagged lawn foundation or ask your own question. How do I get rid of the large cracks in my lawn due to the lack of rain? How can I replace zoysia grass when it's also in my neighbor's yard? How can I ensure my new garden border doesn't tip out like the current one is? Is this pile of dirt in my grass a sign of a pest? What are these small black winged insects in my lawn? How to avoid damaging waterlogged lawn in winter? Could you please identify this weed in my lawn?